Random House Trade Paperbacks, 9780812971781, 400pp. 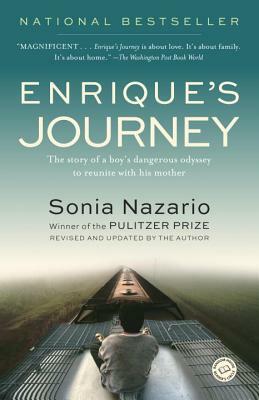 Based on the Los Angeles Times newspaper series that won two Pulitzer Prizes, one for feature writing and another for feature photography, this page-turner about the power of family is a popular text in classrooms and a touchstone for communities across the country to engage in meaningful discussions about this essential American subject. Sonia Nazario, a projects reporter for the Los Angeles Times, has spent more than two decades reporting and writing about social issues, earning her dozens of national awards. The newspaper series upon which this book is based won the Pulitzer Prize for feature writing, the George Polk Award for International Reporting, and the Grand Prize of the Robert F. Kennedy Journalism Awards. Nazario grew up in Kansas and Argentina. She is a graduate of Williams College and has a master’s degree in Latin American studies from the University of California, Berkeley. She lives in Los Angeles with her husband. For more information, visit www.enriquesjourney.com.